This tomb is constructed on fairly classical lines and comprises three chambers, one following the other in a straight line. It is approached by an inclined plane with steps on either side. Flanking the doorway are representations of the deceased standing before Harmaches and Osiris (a), and Amon and a goddess of the dead (b). The two pairs of chambers in this part of the corridor have no decorations. On the right-hand wall, over the second chamber on the right (c) are demons of the underworld including serpents and ghosts with the heads of bulls and jackals. At this point is the beginning of the text of the sun’s journey through the underworld. On the left-hand side of the corridor (d) a priest pours forth the symbols for life, wealth, etc. on the deceased Pharaoh, who is dressed like Osiris. The priest wears the side-lock of a royal prince and is probably a son of the deceased. 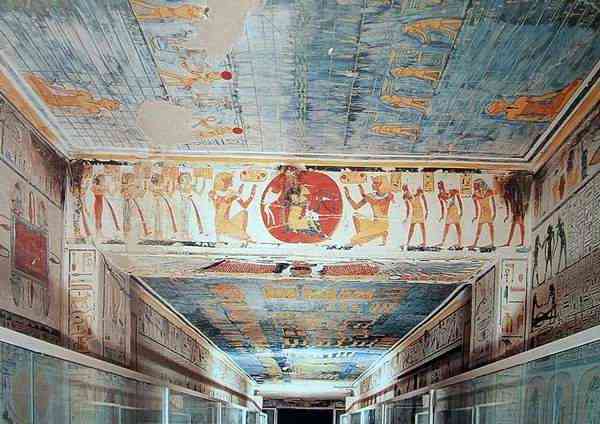 The roof of the second corridor (2) is decorated with constellations. To both left and right (?) serpents rear themselves. Note the recesses for figures of the gods, followed on the left-hand wall (/) 'k J16 beginning of another text from the Book of the Dead and the deceased Pharaoh before the hawk-headed Sun-god. On the opposite wall(g) are demons and spirits. On the left-hand wall (j) are the boats of the Sun-god (centre) travelling through the second and third hours of night bearing protective divinities. We now enter a chamber (4). Beyond, at (k) and (/), are priests with panther skins and side-locks, sacrificing and making offerings before a standard. The next chamber (5) is rough and unfinished and slopes downwards to the burial chamber through another corridor (6). In the burial chamber (7) there are traces (on the floor) of the sarcophagus. On the walls are gods and demons. The goddess Nut, representing the morning and evening skies, is shown across the rough ceiling in two figures. Below are constellations, boats of the stars, etc. On the rear wall (m) the child Horus, seated within the winged sun-disc, is symbolic of rebirth after death.